INDIANAPOLIS -- Lawmakers are vowing to take action in response to a Call 6 Investigation into how schools report bullying incidents. Call 6 Investigators Kara Kenney and Jordan Fischer found schools misreporting how often students are bullied. An analysis of 2016-2017 data showed nearly 60 percent of Indiana schools reported zero bullying incidents last year. “Wow, that’s my first reaction,” said Rep. Greg Porter (D-Indianapolis), the author of the anti-bullying law. “Come on, let’s be real about it. There’s no way you have 3,000 to 4,000 students in a high school and have no incidents of bullying." Hundreds of parents have responded to our findings as well, saying their children have been bullied and they believe their school’s bullying figures submitted to the state are wrong. Porter said schools should convey the truth about bullying, especially since there’s no penalty for reporting incidents. Burton plans to meet with school superintendents and State Superintendent of Public Instruction Jennifer McCormick to talk about a fix to the problem. “Bullying is out of control, and I wish we could do more,” said Burton. Burton said he suspects many schools are afraid to report the truth about bullying out of fear they will be penalized. Senator Jean Breaux (D-Indianapolis) also released the following statement in response to the Call 6 Investigates report on bullying. "The legislature passed a 2013 law requiring schools to submit data on bullying to get a handle on the extent of this very serious issue. I’m disappointed the state still does not have an accurate count on how often bullying happens in schools. If the law is unclear in its expectations of schools, that is something I’m open to revisiting in the 2018 session. In the meantime, I applaud the Department of Education for taking this report seriously and acting to make immediate changes. This data is critical in knowing how each school corporation can best address and prevent bullying. We should have all hands on deck for making learning environments safe for every student." Porter says he is working with youth advocate Mindi Goodpaster on a possible solution to districts misreporting bullying. “I was shocked but not shocked, and I'm disappointed schools weren't reporting they had any bullying incidents,” said Goodpaster, the director of public policy and advocacy with the Marion County Commission on Youth. “They're not taking the issue as seriously as we had hoped." Both Goodpaster and Porter worked for years to get the law passed, and were there when then-Gov. Mike Pence signed it into law back in 2013. Both Goodpaster and Porter suspected some schools would not report accurately, because there’s no punishment for failing to submit the correct information. Goodpaster said schools may be overwhelmed with their reporting requirements, they’re not educated on the law, or they aren’t making it a priority. Child advocates emphasize the law is in place for a reason. "The reporting was just to try to get some data statewide on what our problem really is,” said Goodpaster. “It was not intended to penalize the schools or say you're a bad school, but rather here's your issue and let’s try to put the pieces together." Some school districts, like Indianapolis Public Schools, admitted they misreported and vowed to do better , but other districts stand by their zeroes. Porter wants schools to re-examine their reporting procedures, and he’s planning to bring together at least twenty groups ahead of the legislative session. They plan to look at possible legislative solutions, including tweaking the language in the law, adding a penalty for districts who fail to report bullying, or giving the Indiana Department of Education more tools to verify bullying figures. IDOE does look at the schools’ bullying protocols and procedures. “We spot check, yes, but we don’t say what about this student or what about that student,” said David Woodward, director of school building physical security and safety for the Indiana Department of Education. 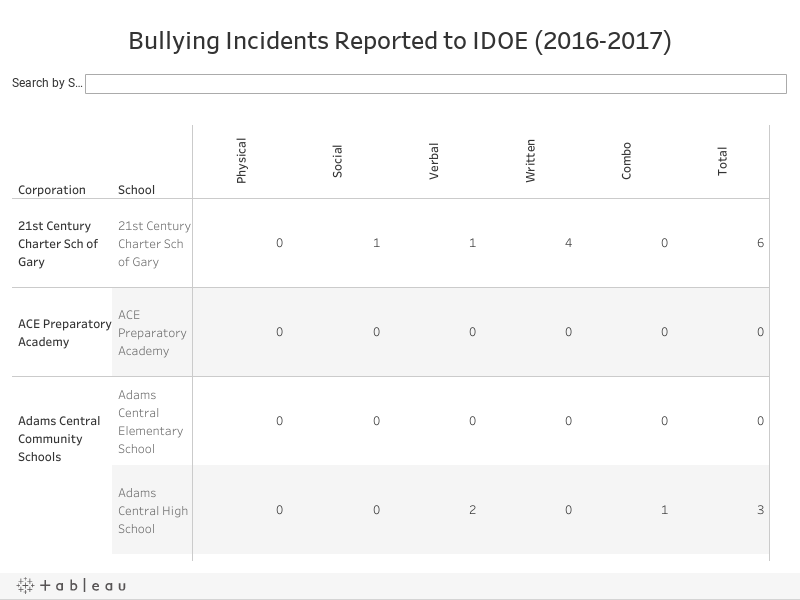 In response to what Call 6 Investigates found, the state is also making changes to make sure schools accurately report how often students are bullied by adding an extra step when school administrators enter the data. “There's always daylight in legislation, and we want to expose the daylight that is there and then come back and move forward," said Porter.